It seems TransLink is reading the Rail for the Valley blog and is worried that Bombardier Inc. has folded the Innovia Metro line into the existing Movia Metro Line of vehicles and that Innovia production may cease cease altogether. With the aging pygmy size MK.1 cars working two to three times harder to carry the same amount of people as a a modern metro car, they are showing a lot of wear an tear after 34 years of regular service. TransLink needs to renew the fleet before maintenance issues overtakes operations and the system goes ka-put on an all too regular basis. Thus TransLink is ordering 200 new MK. 3 cars. 200 cars means 50, 4-car trainsets. Now 200 MK. 3 cars heralds out right replacement of all Mk. 1 consists, which equals to 25 – 6 car consists. This is the equivalent to about 30 – 4 car MK. 3 trainsets. This leaves 20 for new service. That remaining 20 will be just enough for a partial Broadway (6.6 km worth) and a full 17 km extension. This leaves the 14 4-car Mk. 3 trainsets already on order to handle future extensions and extra capacity on the Millennium Line. So yes, they will have just enough trainsets available but they are now fully committed to keeping the aging Mk. 2 vehicles going as well, while the MK.1 cars are sent to pasture. Is the stage 3 funding needed to complete the order? Is this order even covered in the current 10 year transit funding plan at all? Or is this just a re announcement of previous and planned new orders from the current 10 year plan, just with the numbers redistributed into different groups? Why does TransLink continue the sham bidding process for car procurement? ART Innovia SkyTrain is a proprietary railway and only Bombardier Inc. makes the cars to operate on ART Innovia Lines. TransLink will pay what Bombardier tells them to pay. In spring 2019, TransLink will issue a Request for Proposals (RFP) to procure approximately 200 SkyTrain cars. In response to customer requests, refinements to the interior layout of the new SkyTrain cars are being considered. Have your say by participating in this short, approximately 5-minute survey. The survey will remain open until January 25, 2018. “But these capacity increases will not necessarily be a result of new Bombardier products, as for the first time TransLink is actively seeking highly competitive bids from around the world. To date, all three generations of the Mark series of train cars, using highly-specialized linear induction motor (LIM) technology, have been designed and built by Bombardier. But this technology is certainly not proprietary. Mr Zwei, what **exactly** do you say is “proprietary” by Bombardier; that would exclude other manufacturers from supplying cars to Skytrain? You have often previously cited engineering patents held by Lavalin. What are they, exactly, and how would they prevent other suppliers? “To date, all three generations of the Mark series of train cars, using highly-specialized linear induction motor (LIM) technology, have been designed and built by Bombardier. But this technology is certainly not proprietary”. “There are other manufacturers that produce LIM trains. I think we will be looking during our RFP for them to demonstrate what their experience is exactly with LIM,” added Babiuk. This is obviously a message to the skeptical members of the public (including Zwei) and a warning to Bombardier from Translink, that we will go elsewhere. I want to see what Bombardier says in response. If Translink goes out to the wider world of rail transit vehicle manufacturers but still chooses Bombardier at the end of their RFP process as the vehicle supplier, you will have your answer about how tight Bombardier’s control actually is over Translink. The next two years will be quite illuminating. The RFP process requires at a minimum, a 8 month selection process for transit vehicles under Canadian Law, so this whole thing could take a year and a half before we know who which companies will be the final bidders and probably 3 -6 months beyond that to see who actually wins the contract. The Linear Induction Motors used on SkyTrain came from the Krauss Maffei Transurban MAGLEV, which the UTDC purchased the patents for, which were later sold to Lavalin, which again resold to Bombardier at the Lavalin bankruptcy sale. The LIM’s are attractive LIM’s, which being the wrong sort of LIM, as attractive LIM’s need a lot of maintenance because of the 1cm air-gap needed between the LIM and reaction rail. Now several companies produce LIM’s but if i can remember back to the early 2000′s, a chap from Siemens told me that the intended vehicle has to be almost custom made to fit the LIM. Thus Bombardier’s cars are of a proprietary design to use the LIM’s they are using. No other company has this information. Thus for a company to bid against Bombardier a new car must designed to fit the operating parameters of the LIM’s used, which will add about $60 million to the cost of development, testing and a safety case for the vehicle. This gives Bombardier Inc. a clear commercial edge over its competition. It is the package, which uses the LIM that is proprietary. Notes: The faux Canada Line P-3 was won by a SNC Lavalin lead consortium, which knew that building a LIM operated transit system was more expensive than a conventional one and why they used a ROTEM EMU as the transit vehicle. Lavalin was also part of the Bombardier lead consortium pushing for SkyTrain. As well SNC Lavalin made sure that light rail vehicles were not allowed in the bidding process but Alstom and Siemens pushed for this because of the inherent flexibility and economy of operation. Both were dropped from the bidding process. I was told by a Siemens official that using a metro car on the Canada line would have been “unprofessional”. Zwei, “proprietary” means a legal monopoly. Your answer now shifts from this to “commercial advantage”. Of course, as current supplier Bombardier has this advantage, but this is different than your “sky is falling” warning that Vancouver will be totally hooped if/when Bombardier drops the Innovia line. Sure it will cost $$$ to design cars to fit in LIMs but I doubt such “packages” are proprietary. LIM cars made by other suppliers operate elsewhere, they just need to adapt their “information” to fit the Vancouver parameters. Say the cost is your $60 million. This is a “commercial advantage”, it is not about “proprietary”, “engineering patents”, etc. Skytrain cars have been running for over 3 decades, so “attractive” LIMs DO work. My friend was a Skytrain technician who operated the lathe to grind down car wheels to maintain the necessary gap between the LIM and the rail. He says that maintaining this tolerance is NOT a big deal. I take his word over yours. OK, perhaps it should have said “after obtaining the revised Transport Canada permits for this capacity” but it seems Skytrain thinks they can do this within the Phase 2 funding rather than first dropping in your $3 billion? in needed upgrades. Who is right on this point? Zwei replies: I know you are a professional troll, probably working for Translink, so be it. With the “attractive LIM” as used on the ART Innovia vehicles, the system is proprietary as no one else uses them. This is important as one will either have buy them from Bombardier or develop themselves. The problem here is that attractive LIMs are the wrong sort of LIM and are both expensive to maintain and problematic in operation. No one really wants to deal with attractive LIM’s for a one shot car order. As stated over and over before, the maximum leagal capacity of the Innovia lines is 15,000 pphpd and has nothing to do with cars being available, rather the electrical supply to operate them. So these cars will not increase capacity to the degree you think they will. As there absolutely “0″ oversight of TransLink, they can claim what they want to claim without fear of being discovered. Translink ridership numbers are given in “boarding’s” and not linked trips, because raw boarding numbers are much higher. After viewing the Expo line from a vantage point in East Vancouver, there is no way they are carrying the number of people they are claiming. Until we have politicians with the moral fibre to stand up to TransLink and provide proper oversight, the same old BS will prevail. No one buys with SkyTrain anymore, no one wants the damn thing, yet you and thousands like you pretend that the proprietary railway is the best thing like sliced bread. Only 7 built in 40 years; only 3 used seriously for urban transit; not one sold in the past decade. A quick note on the Daily Hive. They fudge the truth and unlike this blog, if i write something that is off, a few real engineers will tell me, either via the blog or by phone and they do. A n note on the 1 cm air-gap needed for the LIM’s, not only do the wheels wear down, so does the track and the reaction rail also needs adjusting over time. Expensive. As well, all vehicles must accumulate the same mileage as so to have equal wheel wear. There are many more problems with LIM’s and why only proprietary railways use them. Anyway, Bobbi was telling me that the 16.7% in passengers/hour/directon increase is coming mainly from the smaller Mk. 1 cars being fully retired and the slightly more efficient propulsion units on the newer Mk. 3 cars. They draw less current than the older vehicles so a few and he stressed it , A FEW more trains can operate without overloading the aging power systems on the Expo Line. The newer vehicles also move passengers more efficiently. These new sets of Mk. 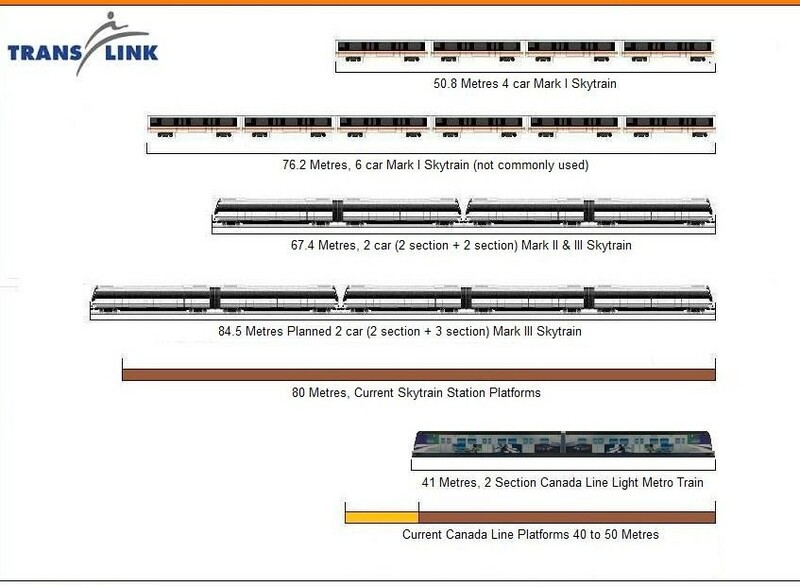 3 Skytrains not the ones already on order, can be more easily expanded to allow a 5th centre car. The work will have to be done at the factory in Kingston because your existing maintenance and operations complex is far too crowded. to quickly do the work. The earlier Mk. 3 Skytrains will require a lot more effort and repositioning of equipment to add a 5th section. They won’t have to alter operating certificate to do this work, so Transport Canada and its Canadian Transportation Agency people won’t be involved for now. There’s a big catch to operating at 17,500 p/h/d because Translink according to Bobbi is making some very optimistic assumptions. The first one is that the aging Expo Line electrical system stays efficient as it is now. As the entire Expo Line electrical system ages along with their cable connections, transformer equipment, 3rd rail connections and the electrical cables themselves, their efficiency will drop. It’s already happening some system efficiency has been lost. Lose too much and fewer trains can operate. The fix is spending a s**t load of money on real upgrades. Not the toying around they are currently doing. It’s in the hundreds of millions of dollars. Some track work needs to be done first, like replacing a few slow speed turnouts with higher speed ones at terminal and key stations. This is somewhat affordable but incredibly time consuming and will probably require weekend closures of certain stations or entire sections of the line. A better rail grinding is regime is needed as well. The first few Mk. 3 trainsets have high wheel wear. Translink has had this problem before and still has trouble convincing the powers that be that, more money needs to be spent on track work. If they go back to their present system 17,500 p/h/d will cause big maintenance headaches on these newer trainsets. One of the reasons the Skytrain was sidelined by LRT to Langley initially was that an expensive new light maintenance centre is needed somewhere along the Surrey to Langley extension, the LRT maintenance and operations centre would be smaller and cheaper, than the Skytrain equivalent. Ideally it should have been on the Evergreen extension. But somewhere heated and roofed where trains can be at the least stored, cleaned and given needed light maintenance. This would shorten the ever growing time it takes to prepare the fleet for service. More trains means more cost and more time needed to prepare trains. The existing single maintenance, storage and operations centre is taking longer and longer to get trains into operation each day because of crowded conditions in the yard complex. The bigger the system gets, the earlier and earlier operating trains have to be sent out to points further and further away from the maintenace and storage centre to start off or end service for the day. New Skytrain Maintenance and Storage facilities aren’t cheap. You are talking hundreds of millions dollars not just for the building and the overly expensive non standard Skytrain only equipment but because of high land costs as well. Like all rail transit systems, you rarely get to more than 92% of its stated ultimate peak hour capacity during normal operating conditions. Unless big station upgrades happen with this extra 16.7 % of peak hour passenger capacity, really crowded stations will get even more crowded and more unpleasant to be in. This will deter some choice transit passengers away from transit, thus making it even harder to get the stated higher passenger capacity offered by the new trainsets. Bobbi told me that, ultimately what needs to be done is a massive upgrade and expansion of most of the Expo Line’s systems and stations. Obviously this is expensive and time consuming. We’re talking Billions of dollars. He wished that Translink would at the least admit this to the public. Any large increases in train frequency will require Transport Canada to do their multiple year safety audits and yes billions will have to be spent. Things like new Skytrains with slightly bigger passenger carrying capacity are just fiddling around the edges. Big money needs to be spent on the aging Expo Line there’s no way around it. Bobbi is now happily retired from Translink and working in Ottawa for the federal government. Zwei replies: Thanks for the clarification. I also know a former UTDC guy who is happily retired and living in Delta and he has told me that the operational contract with the UDTC for SkyTrain was a maximum capacity of 15,000 pphpd, but he added, that the system, due to both electrical and signalling shortcomings, cannot obtain the maximum capacity and that Translink fudges the figures to give the impression they are carrying more people than they really are. He also said he wished that TransLink was more honest with the operation of the metro and the many issues of maintenance that is connected with it. The guy is a big fan of SkyTrain, but he even admits that sending it to Langley would be a big mistake and a waste of resources. He said it would be far better to add a subway loop under Vancouver’s West end and extend it under Stanley park to the North shore as a lot more people would use it. He also said there just isn’t the ridership for a SkyTrain subway to UBC and it would be best to build it elevated down 4th Ave instead. The big problem, he said, was that TransLink just does not do the maintenance that is required for the metro and that causes a lot of problems. @Bill Burgess, it not that Skytrain doesn’t work, your right it does. However, it’s one of the most overly complex rail transit systems ever. This makes it expensive to build and actually expensive to operate. Yes, when the system was small and new it probably was cheaper than the other existing rail transit systems available at the time. However, compared to newer rail equipment, it’s expensive, small in capacity and very complex to run affordably and considering very few cities use comparable systems it’s spare parts are expensive and getting more so as it ages. Also quite ironically, it requires a much larger maintenance staff than newer equipment. The Skytrain technology hasn’t aged well! Our Schwebebahnn works well, over 100 year but no one has copied it – would you say that the SkyTrain LIM’s are good because they move trains for 3 decades? There is an inconsistency that I think Mr. Zwei has overlooked, you do not grind wheels to maintain an airgap. Skytrain technician who operated the lathe to grind down car wheels to maintain the necessary gap between the LIM and the rail. He says that maintaining this tolerance is NOT a big deal. I take his word over yours. This is a not honest statement because by lathing the wheels, you reduce the height. A well operated metro system, over time lose about 1 cm due to wheel and track wear and as I understand it, the LIM would run lower and strike the plate. I would say this man is talking nonsense. LIM are the propulsion system for MAGLEVs, though our French neighbours tried once to use a propeller…snip, so maintaining airgap is not problematic. There has been in the past some communication with BC Transit years ago and they said they had to manually adjust the LIM and the reaction rail. But the LIMs do not today offer any benefit and the cost is greater when one factors in the cost of the reaction rail. A regular motor is just fine for railway propulsion. …. but I do not recall him advocating for the use of LIMs on railways. Herr Zwei is quite correct about lack of sales for SkyTrain and after the UDTC dismal showing of it on our side of the pond in the 80′s it was found wanting. It is no better than our Schwebebahn. Mr. Zwei: I do not work for Translink. Please do not repeat this suggestion. Contrary to your typical reaction on this blog, people who respond to what they think are incorrect claims by you are not all trolls. I did not suggest that Skytrain is the ‘best thing since sliced bread’. I agree that it’s small number of sales indicates that Skytrain is not now in most cases the best available option. The main reason is no mystery – high capital costs. But you conflate this with what is a different issue in Vancouver – whether to extend an existing system. I responded to your claim about other suppliers being excluded due to “proprietary” technology. I note that you have not supported your claim. Also, still count me as a skeptic of your claim (as usual, not referenced) that other transit rail LIMs are not the ‘attractive’ type. Or, cite evidence, and I will renounce my skepticism on this point! On operating costs (these include maintenance): How do you square your claims with the comparative ratios of ‘fare-box’ revenue to operating costs? According to Wikipedia (https://en.wikipedia.org/wiki/Farebox_recovery_ratio) Vancouver’s 58% is higher than most North American systems, including Seattle, Portland, Edmonton, Calgary, Ottawa and Montreal, though lower than Toronto’s. Measuring ridership by boardings does not enter this ratio (but again, Translink does also report journeys, i.e., linked trips), and it is very hard to ‘fake’ revenues. These ratios include buses, etc. as well as rail systems (and also Upasses), but do not indicate that Skytrain is a big burden in terms of operating costs. I think Translink fares should be reduced or eliminated (like the motion currently before Vancouver City Council to eliminate fares for under-18s), but that is a different issue. Mr. Causans: Grinding wheels is part of maintaining the gap between the LIM and reaction rail. As Mr Zwei notes, uneven wheels need to be standardized, the LIMs position gets adjusted up and down, and the reaction rail gets attention. But I still take my friend’s first-hand opinion that the gap is not a major problem, e.g., relative to the equivalent effort needed to maintain traction motors with moving parts. How many of the latter are still in service after 30 years of continuous operation? Again, this is not to say LIMs are now the very best choice. Mr Cow: Thanks for the insight you have passed on from ‘Bobbi’. But reading between the lines, it seems you are accepting that Skytrain can creep past the 15,000 pphpd towards 17,500 (or, if you prefer, your 92% of those two numbers) without the huge capital costs ($3 bill?) that have previously been cited on this blog. Also, that the operating certificate is not an immediate constraint to surpassing the 15,000 mark. But please correct me if not. More wholesale replacement of three- or four-decade old infastructure will eventually be required. Who ever imagined differently? But, for example, does ‘Bobbi’ exclude that the increased ridership that will result from the Surrey extension and the Broadway extension can be accommodated for at least a few years by the work on the Expo/Milennium Lines that is currently scheduled and ‘funded’? Mr Zwei – and I thought also you – have previously denied that this is possible. It would be a real scandal if Translink is blatantly lying about what is actually possible within current technological and legal limits, but I just don’t see the evidence for that. Zwsei replies: so touchy are we not, just like most Translink types who pass themselves off as others. I do not know why you bother, you don’t like me and you do not like this blog. Capacity does not equal increased ridership, because current ridership is less than what Translink claims and until there is an idependant annual audit of ridership, TransLink can claim what it wants, without fear of a contrary report. It is well understood that Translink inflates ridership numbers by various methods, including using “Boardings” which many transit customers make many in their daily commute. My wife is a good example, she makes 6 boarding’s a day bus > Canada line > bus and the reverse. Because the evidence points to the fact that SkyTrain is not near capacity, by increasing capacity in cars by reducing seats (a sure way to deter ridership because seating is an important issue with North American transit customers), I don’t see any major increases in the near future. Also TransLink calculates capacity on the old and somewhat discredited all seats filled and 8 persons per metre/sq model, thus capacity offered is much less, but so is ridership. Here is the problem TransLink finds itself in, very few people, except the gullible or agents of the SkyTrain Lobby, actually believe what TransLink says. This is now coming into the fore at UBC because despite the claims of the UBC Board, a few brave academics are now fact checking TransLink and SkyTrain and some embarrassing facts are coming to light. Of course you will not believe it because you like SkyTrain; you prefer the fake news from the Skyscraper page or SkyTrain for Surrey or the Hive. So we have now come full circle, as the rail for the Valley offers vetted facts by real experts who do correct mistakes, while the SkyTrain types will not believe a word from here. sort of like American politics. But you never, ever come to grips with the basic fact that only 7 of the proprietary SkyTrain’s have been sold, of which only 3 are seriously used for public transport. Of these 3, all were forced upon the operating authority by senior governments and soon one will be torn down as it is life expired. The reaming four are 1 demonstration line, one theme park people mover and two airport people movers, of which none were ever publicly vetted, but imposed by various agreements. Of the 7 SkyTrain lines, both eh Kuala Lumpor ART and the Yungin ART are mired in legal proceedings. Only Vancouver is extending its SkyTrain but again without any real public consultation, by now a discredited Vision Vancouver city Council and a rapidly becoming discredited mayor of Surrey, funded by TransLink which ejected the outcome of the 2015 plebiscite which decidedly went against TransLink and the provincial and federal governments who are using SkyTrain to funnel money to corporate friends, Bombardier and SNC Lavalin. Oh by the way, before you chortle too much about fare box recovery, do remember that Translink’s U-Pass, where 130,000 or more monthly fares are automatically paid for, if the person uses them or not. Gerald Fox on his crtique of the Evergreen line’s Business Case. @Bill Burgess, it will take many years for that extra capacity to arrive. Most of the new Skytrains will have to be in use before that capacity will even increase above even 15000 passengers/hour/direction, 2024/25 at the earliest. By that time the power system will won’t be efficient enough anymore. The rail grinding issue is around because an asymmetrical rail profile arrangement needs to be done. They tried this before when the Skytrain fleet was experiencing excessive wheel (flange) wear back in the late 1990′s and both the Skytrain’s track maintenance staff and Translink’s management were dragging their feet and fought it every step of the way. They found it to be complex and manpower intensive and more costly than their previous rail grinding regime. The company that came up with this answer fought 2 years with both the staff and Translink management. When the company came back to check if the new regime was working 4 years later, the new regime wasn’t being used and the wheel wear issue (similar what is currently happening with the early Mk. 3 trainsets) had returned. I guarantee if they don’t change their track maintenance program, 17500 p/h/d will never happen. Let’s not even talk about their absolute intransigence regarding the installation of the high speed turnouts, needed for 17500p/h/d. It’s just not going to happen unless, Translink doesn’t want to even higher operating costs. Both the Langley and stage 2 Broadway extension from Arbutus to UBC don’t come close to providing enough passengers for their costs. Translink even admitted that east of Fleetwood there just isn’t enough ridership for an extension to Langley, considering the cost of the extension, not now or even in 15 to 20 years. That’s why they originally wanted a LRT system. Everyone, the Broadway extension just isn’t needed right now especially when you consider how many passengers currently use the buses on Broadway. There are bus management technologies and strategies that Translink could use but refuse to. Both the stage 1 and 2 Millennium Line extensions are costing more now per km than the last subway extension in Toronto, that was late and over budget because the province forced a scope change in the project delaying it and adding huge costs. The stage 1 Broadway Line extension is $423 million per km. The Spadina, York U, Vaughn subway extension (which just opened in 2018) will cost around $400 million per km once legal costs are added in. This subway extension currently carries twice during the peak hour what the stage 1 Broadway extension will carry in 2041 and almost 5 times the peak hour passenger flow that the stage 2 Broadway extension is expected to carry in 2041. This conventional subway line in Toronto can move over twice the practical capacity of the Skytrain system using the existing 60 year old signalling system not the new CBTC system being installed on the line, which will expand capacity by 20-25%. Thank you, tour knowledge of the real issues is of great import, as you work in the industry, you know what the problems are. I do know that there was a cadre at BC Transit that had come to the decision that SkyTrain was not the way to go, but history slapped us on the face as the ten Glen Clark government got bought off by Bombardier to flip flop from LRT to SkyTrain. I do remember a phone call from a senior bureaucrat from BC Transit appalled at the decision and said that the NDP was stabbing itself in the heart, with the vast number of NDP types working on the old Broadway Lougheed LRT project. he proved to be correct when the NDP won only 2 seats in the next election. The “Rail For The Valley” website and its owner, Malcom Johnston, are clearly delusional. All of the “opinions” stated about the superiority of LRT over Skytrain are just that, they have no basis in fact. There are no citations or references to any supporting documents, most likely because there are none. Zwei replies: Malcolm Johnston does not own the website, he contributes to it. If SkyTrain is so good, why have the owners of the proprietary light metro system not allow it to compete directly against light rail? Why have only 7 such systems been built in the past 40 years? Why has it had its marketing name changed 7 times in 40 years? Get the hint sunshine, there is little documentation because no one wants the bloody thing. Only Metro Vancouver and in light of the multi billion dollar money laundering scandal happening here I would surmise a little of that money has gone to the SkyTrain Lobby, who have spent a life time trying to make a square peg fit into a round hole. If you wish to convince people of your opinions, you need to back it up with concrete evidence, not just repetitive rants about how many Skytrain systems have been built elsewhere. This gets old really fast! Are you an “expert” on transportation issues? If so, what are your credentials? Your argument about nobody wanting documents is total b.s. How can a person or government body reasonably decide on one course versus another without knowing the facts and figures behind each option? If you really want to change what the Mayor’s Council has decided, I suggest you put together a comprehensive document explaining your position, along with credible citations and references, and present it to them. If indeed what you are saying is supported by this document, and can be verified to be factually correct by others, wouldn’t the Mayor’s Council change their mind on Skytrain vs LRT? I suspect that you do not desire to produce such a document because the facts and figures would not support you, and you would need to resort to vague generalities, and supposedly real anecdotal evidence from unnamed expert acquaintances of yours from the transportation field. Please excuse the extreme sarcasm in the last sentence. This is why no one outside of the few loyal readers of this blog/website take you seriously. You just keep spouting the same drivel (opinion not fact) over and over again. Also, I find it very ironic that you are talking about making a “square peg fit into a round hole” as you appear to be a very square peg in this case. Zwei replies: I never said i was an expert, but I take advice from experts. There is no independent documentation about SkyTrain, because no one wants to build with it. All we have is claims, based on spurious studies. Look it sonny, ALRT/ART SkyTrain was showcased at EXPO 86 and given unprecedented exposure for cities to see what SkyTrain is all about. Both BC Transit and TransLink have been in partnership with Bombardier to sell SkyTrain abroad, but there was no takers. We know that from about 1983, SkyTrain has been deemed inferior to LRT. Don’t like it, too bad. No one wants the damn thing. Even commissioned studies in BC, such as the Greer Report, showed that the claims for SkyTrain were unfounded and LRT was the better option. In BC who pays off who is the real reason we build with it. Gert over it. Go to a Trump rally, you will feel better. Sorry James, you had your say, you do not like trams. so be it, but i will not tolerate personal attacks. As for experts, find me an expert, and i mean a real expert who resides outside of BC that supports building with SkyTrain. You still will not accept that only 7 such systems have been built and only 3 of these are seriously used for transit. You will not accept that SkyTrain costs a lot more to build operate and maintain than LRT and it is capacity constrained. You will not accept that no one wants the damned thing. So go live in your little SkyTrain world and dream SkyTrain dreams because that is all what’s left you. Within a decade, SkyTrain will be no more and we will be left with an aging infrastructure designed for 1970 transportation problems. You are the one getting personal by telling me to go to a Trump rally, so I responded in kind. If you can’t handle that, I will leave you alone so that you can play in your sandbox all by yourself. Zwei replies: Absolutely meaningless as there has never been an honest debate about SkyTrain and LRT. Zwei relies: Er no, you are wrong, the max capacity is 15,000 pphpd and LRT’s capacity is 20,000+pphpd. Speed is non issue as it is dependant on many factors. - There are indeed fewer Skytrain systems around the world because they are more expensive to build. However, you do not seem to realize that any transit system of higher quality will naturally be more expensive. Cheaper (in the traditional meaning of this word) systems like LRT do not have the speed or capacity of Skytrain which will still be operating long after you and I are gone. LRT systems will need to be replaced in a much shorter timespan because of their limited capacity. And yes, it will be expensive to upgrade and maintain an aging Skytrain system, but what type of system will not? Certainly not LRT! Zwei replies: Absolute garbage, not a trace of truth in what you say. Obviously you are a troll because any knowledgeble person would not write such garbage. All of what I have said is available in many reports and analyses that have been done in the past. Of course, in your world, they have all been fabricated and manipulated in some type of X-Files conspiracy theory. Zwei replies; What reports and analyses, you don’t list any and why, there is none. I am not a troll, and in fact, I rarely post on social media or websites at all. However, the insanity of your arguments has aroused my curiosity. Perhaps, it is actually you that is the troll, provoking reasonable people to correct someone that is so obviously wrong. Zwei replies: You are an idiot, adios! Of course, this is your website, so you can choose to blacklist whomever you please. It is always amusing to see the lack of transit education the supporters of your SkyTrain have. It is certainly eye opening. Herr James displays the typical vacant knowledge about transit, your SkyTrain and the modern tram. Many years ago, the company that owned your SkyTrain tried to sell in Europe, but it was soon discovered to so inferior to other products it was not worth the investment. The city of Milan almost purchased one but common sense stopped the sale, on the basis it did not meet EU safety standards. Mr. James also seems unaware that four of your SkyTrain’s are not used in any meaningful public transit use, instead they are airport people movers and one a theme park people mover. Already there is plans to replace the JFK SkyTrain with metro to provide direct service and two are mired in legal troubles. SkyTrain is not a better product. As for capacity, this is a silly debate because any transit system can configure capacity to meet demand. From what Herr cow says, it is SkyTrain that comes up with the short end of the stick. From my personal experience, the majority of light-metro systems built have been due to political interference, than anything else. I would also like to say, that when we were involved with the Canada line, we were forbidden to use modern trams instead of metro cars, even though the trams were faster and able to climb steeper grades and carry more people. Mr. James should also ponder why the Canada line did not use SkyTrain? We have the same sort of expert across the pond, one who knows everything but has read nothing.